This post is sponsored (and written) by Visa! Thanks, Visa, for your support of NOTCOT! A picture’s worth a thousand words, right? Or more? And at 30fps, video must be worth millions! Now geolocate those photos and video … and they’ll be worth trillions! Vacation photos and videos are dreamy escapes you have for the rest of your life… as for how you share them, options keep expanding and the latest is the Memory Mapper application at the Facebook.com/Visa. Merging your photos and videos with Google Maps satellite technology (think of that fun flying feeling you get playing with Google Earth as you zoom in and out from one place to the next!) all set to music, essentially creating a whole visual experience to share with your friends! How it works: Upload your photos and videos, enter personalized captions and the addresses of where the action took place then choose a soundtrack. 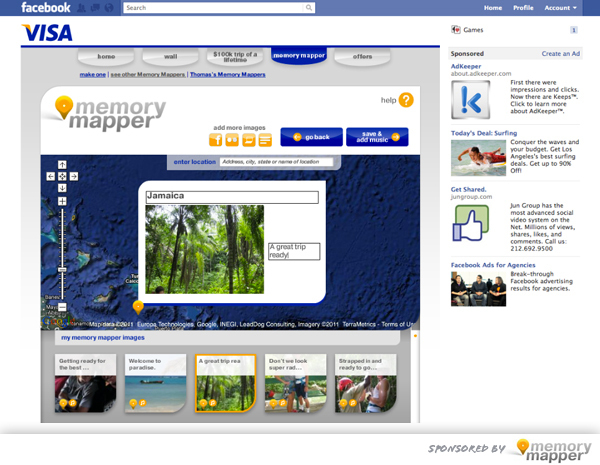 Memory Mapper will merge Google Maps satellite technology with your content to create a multimedia travelogue. You can even post your creation on your friends’ walls, tweet to your followers or email to friends and family to make sure they don’t miss it. Besides sharing memories with this app, when Visa cardholders use their cards from now through October 31, they will be automatically entered for a chance to win $100,000 to plan their ultimate trip of a lifetime. Head to Visa’s Memory Mapper at http://www.facebook.com/visa to turn your travel tales into stories of legends. NO PURCHASE OR OBLIGATION NECESSARY TO ENTER OR WIN THE VISA 2011 TRIP OF A LIFETIME SWEEPSTAKES. Open to legal U.S. residents, 18 years or older as of 4/27/11. PIN-based and ATM transactions are not eligible. Void in Puerto Rico and where prohibited. Sweepstakes ends 10/31/11. For complete details on non-purchase entries, http://on.fb.me/jBn2PD.